When it comes to treating eye conditions, homeopathic euphrasia is one of the better remedies available. After all, the homeopathic remedy is made from the plant known as “eyebright.” It is believed that eyebright got its name from a traditional indigenous medication for treating eye irritation. The herb eyebright has been used to treat eye strain and inflammation since the Middle Ages, whereas today, herbalists use it for infections and allergic conditions of the eyes, sinuses, nasal passages, and middle ear. In a similar fashion, homeopathic euphrasia is used to treat eye problems, including conjunctivitis, blepharitis, styes, and eye strain. At the same time, homeopaths prescribe euphrasia for allergies, measles, and cold symptoms. Read on to learn more about homeopathic euphrasia, and its various uses and health benefits. Homeopathic euphrasia is made from the plant Euphrasia officinalis, and it is a member of the plant family Orobanchaceae—also called the figwort family, and formerly the Scrophulariaceae family. The Germans call it augentrost, and the French know it as casse-lunette. Other names for Euphrasia officinalis include eufragia, glossy eyebright, common eyebright, meadow eyebright, reed eyebright, and drug eyebright. In herbal medicine, alternative names for eyebright include herba euphrasiae, herbe d’euphraise, and augentrostkraut. Euphrasia is an annual plant native to Europe, but it can also be found in North America and Northern and Western Asia. Euphrasia species can be found in grassy meadows or snowy areas. 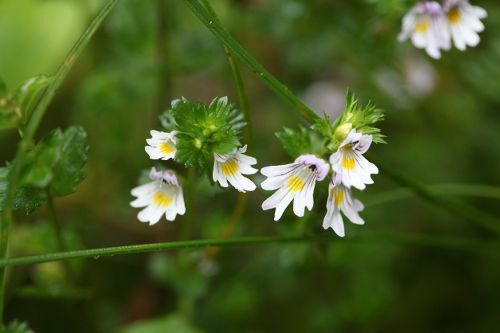 The eyebright herb grows two to eight inches in height, and has deep cut leaves. The eyebright flower petals are often lip-shaped with violet, purple, or blue-white colors, and it blooms between July and September. When a flower has bloomed, a fluid extract can be prepared from eyebright. The roots are also used during the preparation stages. Herbal eyebright is often used for medicinal purposes in several forms such as essential oil, tea, liquid, tablets, capsules, and loose dried leaves. The herb exhibits several activities, including anti-inflammatory, antioxidant, anti-cancer, antimicrobial, antiviral, antifungal, anti-mucus, anti-epilepsy, antibiotic, liver-protecting, and hypotensive properties. In the 14th century, eyebright was considered a cure-all for all apparent evils of the eyes. Eyebright tea was popular in the 18th century, while eyebright ale was common during the time of Queen Elizabeth I. For external use, the herb euphrasia is a great eyewash. For this purpose, it should be used in herbal tea form and prepared using distilled, sterile, or cool boiled water. Homeopathic euphrasia is created by taking the fresh flowering plant and the root, and chopping it. It is then macerated in alcohol, and the end result is homeopathic euphrasia that contains virtually no traces of the eyebright plant. As mentioned, homeopathic euphrasia is a key remedy for eye problems. In Greek, the name euphrasia originates from the word Euphrosyne. It means “gladness.” In other words, eyebright brings gladness to anyone with eye problems. In particular, homeopathic euphrasia is used for several eye conditions, including conjunctivitis, sties, eye allergies, cataracts, blepharitis, eye strain, granular eyelids, and glandular swellings. It is also used for dry, inflamed, and stinging eyes. In such cases, the eyes will water profusely with a pungent smell. Coughing, open air, or lying down may lead to intense eye watering, and the tears are considered hot. Often the eyes are also sticky in the morning. For granular eyelids, euphrasia is helpful when the edges of the eyelids turn red, while they are also distended and there is a burning sensation that makes the eyes very sensitive to the touch. The person often suffers from enhanced sensitivity to light, and there is a desire to blink consistently. In general, the eyes are red, burning, and bloodshot with itchy eyelids. It may also feel like a hair is irritating the eye. Sunlight and wind make the condition worse, and winking and eye rubbing help relieve the eye conditions. Conjunctivitis may form after the flu, measles, injury, or other health problems. It is also an appropriate homeopathic remedy for eye rashes with unclear vision and swollen eyelids. There is also a pain of the eyes that will spread toward the head, while there is a sensation or straining in the eyes that feels like sand particles. Euphrasia is also used for eye injuries, especially when a foreign object creates the persistent pain in the eye. It is best to use three 6c euphrasia doses every two hours for eye conditions. It is not a surprise that homeopathic euphrasia is effective for eye conditions, especially since herbal euphrasia eye drops have been shown to be safe and effective for various conjunctival conditions like conjunctivitis. For eye problems, I will dissolve two euphrasia pellets into a glass of water, and dab around the eye with a cotton ball twice daily for three days. In homeopathy, there is something known as the remedy profile. It is a great indicator that determines whether a homeopathic remedy like euphrasia is the best fit for you. Euphrasia is best for people melancholy in nature. The person is prone to daydreaming since they can be easily distracted from those around them and their surroundings. What are the health benefits of euphrasia? Besides eye problems, homeopathic euphrasia is also used for hay fever, allergies, measles, cold symptoms, vertigo, sleep problems, memory issues, skin issues, and digestive concerns like nausea and vomiting. Let’s take a further look at the health benefits of homeopathic euphrasia. Homeopathic euphrasia is also used for hay fever and allergies that mainly affect the eyes. As a result, symptoms may include swollen and sensitive eyes, and burning and thick discharge from the eyes that irritates the skin beneath the cheeks. Other symptoms include bland mucus from the nose that drips down to the back of the throat. The only psychological symptom is irritability due to discomfort from the allergic symptoms. As mentioned, conjunctivitis may lead to the measles. Euphrasia is a good measles remedy, especially when there are profuse teary eyes or light sensitivity. There may also be s sticky, gum-like substance in the eyes. Other symptoms when euphrasia is recommended include throbbing headaches, aching bones, and a burning nasal discharge. There may also be a croupy cough during the day that gets better from lying down at night. Homeopathic euphrasia is also a common remedy for respiratory conditions, including cold and flu symptoms. Some symptoms may include coughs, fever, sinus infections, dry congestion, sore throats, and headaches. The person will also awaken several times throughout the night. The cold tends to get worse when indoors, at night, or the morning, but it will get better outside and in the dark, or after eating a meal. The recommended potency of euphrasia for respiratory conditions is 10 doses of 6c. Where do you find homeopathic euphrasia? Euphrasia can be purchased online or found at the supplement section of a health food store. You will find euphrasia in liquid or pellet form. You can also get euphrasia from your homeopath if they feel the remedy is best for you based on your mental, emotional, and physical symptom picture. Your homeopath will likely have some homeopathic euphrasia on hand to help treat the health problems you’re having. As mentioned, the health benefits of homeopathic euphrasia include mostly eye problems, allergies, measles, and cold symptoms. The homeopathic Euphrasia officinalis is considered generally safe; however, there are some precautions with the eyebright herb. It may reduce blood sugar, and people with hypoglycemia or diabetes should be cautious. Possible herbal side effects for eyebright include excessive urination, constipation, nausea, hoarseness, sweating, nasal congestion, coughing, insomnia, coughing, confusion, toothache, sneezing, and headaches. The general dosage is one pellet or five drops of homeopathic euphrasia every hour for intense symptoms or every four hours for mild symptoms. Once there is improvement, stop taking euphrasia, and only resume the remedy when symptoms return. If there is no improvement after three doses, contact your homeopath. At this point, a different remedy or dosage may be required for chronic or persistent symptoms. “Euphrasia,” Home Remedy Central; http://www.homeremedycentral.com/en/homeopathic-remedies/homeopathy/euphrasia.html, last accessed July 28, 2017. “Know Your Remedies: Euphrasia officinalis (Euphr. ),” Homeopathy Plus; http://homeopathyplus.com/know-your-remedies-euphrasia-officinalis-euphr/, last accessed July 28, 2017. “Euphrasia officinalis – Eyebright – An acute hay fever remedy,” National Center for Homeopathy; http://www.homeopathycenter.org/homeopathy-today/euphrasia-officinalis-eyebright-acute-hay-fever-remedy, last accessed July 28, 2017. “Euphrasia,” The Learning Center; http://www.petremedycharts.com/Learning%20Center/Homeopathy/Homeopathic%20Remedies/Homeopathic_Remedies/Euphrasia_Homeopathic_Veterinary_Materia_Medica.html, last accessed July 28, 2017. “Euphrasia: Eyebright,” Herbs2000.com; http://www.herbs2000.com/homeopathy/euphrasia.htm, last accessed July 27, 2017. Stoss, M., et al., “Prospective cohort trial of Euphrasia single-dose eye drops in conjunctivitis,” Journal of Alternative and Complementary Medicine, December 2000; 6(6): 499-508. https://www.ncbi.nlm.nih.gov/pubmed/11152054. “Eyebright,” herbs2000.com; http://www.herbs2000.com/herbs/herbs_eyebright.htm, last accessed July 28, 2017.